Some 35 years or so ago my friend and I set out to devise a set of Wargaming rules that would give us what we needed in accuracy terms whilst still remaining within the realms of a game. That set of rules is now realised as ?Red Gambit?. The rules are designed for 1/72 and 1/76 scale combat using any size of formation, although they are proven in 1/35 and micro-armour with small adjustments for the former and overhaul of the infantry combat system for the latter. We have the advantage of an exceptionally large dedicated Wargaming area of 8m x 7m, and so we enjoy hundreds of infantry and scores of tanks roaming our battlefields as part of a campaign that has been waged since 1975. Our armies measure some 28,000 painted infantry and nearly 4,500 vehicles and guns. 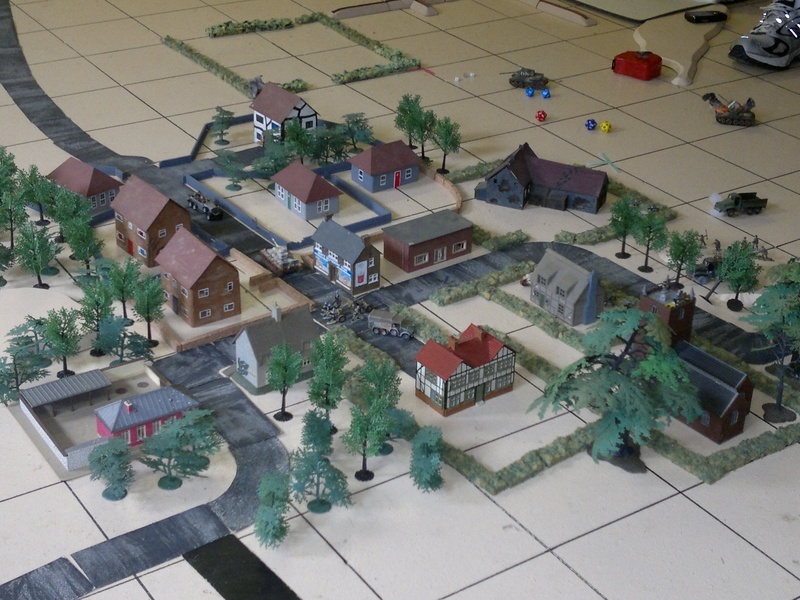 The rules will be equally at home for section or platoon actions on your dining room table or lounge floor. Four independent sections cover actual combat, campaigns, organisation and ancillary guidance. The combat rules should be your first port of call. The rules are also accompanied by a data set which represents years of labour. Most AFV's and guns are charted, with information from armour thicnesses, penetration capabilities, crew numbers, ammunition stowage to numbers available for wargaming. The principles behind the rules are simple. No confrontation, regardless of the size of forces involved, should become a job of work for the wargamer. If it could be done or was possible then make a rule for it but make it as user friendly as possible. Some rules have to, by nature, possess a certain complexity. The majority of rules are based on percentage possibility. We have paid little or no heed to ground scale as model tanks can tend to occupy half an acre if you get hung up on getting things just right. Generally, our rules see 1mm equalling 1 metre for ranges and movement. At this point, certain purists in our hobby will be saying ?it?s one of those is it?? To some extent they are correct in that some elements considered essential to such people are absent, as they tend to prove obstructive to the basic concept of ?game?. [If you form the impression we have exchanged words with such purists you may well be right!] It is our opinion the rules should be tailored to individual needs whilst retaining as much realism as is possible, not realism at all costs. At first sight, there may seem a considerable complexity in them; we assure you they are very easy to get used to. Rules can be phased in as your prowess grows and ignored in the meantime. You will find very quickly that you are able to roll dice without consulting charts, as you will get a ?feel? for what is good and what isn?t. Colin was once a member of a wargames club that used to get 4-6 rounds of play in during an evening meeting. Stupid as it may seem, his suggestion that they throw the dice first and see if it looked good before working out the figures immediately doubled the number of rounds of play each evening! To that end we cast aside conventional slow-moving rules and set about creating our own, glossing over and omitting some aspects and enhancing the areas of play we enjoy. For instance, the facts and figures on tanks are exhaustive and the result of years of research, some of it throwing up contradictory evidence. Perhaps the reader should start with the basic rules of fire and movement before including any of the more involved rules for specialist personnel and equipment. Certainly, we envisage the reader may be ?bogged down? if he/she tries to learn all of this at once. Remember, these rules have evolved for us over many years and some of them are now second nature. For many we have no need to consult charts. Each element is, where appropriate, accompanied by a ?how to play? section which talks the player through the new parts. These should be useful to all readers. Most readers will undoubtedly disapprove of some rules, omissions and styles of play. Feel free to change rules as you see fit. You, the wargamer, know your exact needs and hopefully we have created a set of rules that can have parts altered without great effect upon the whole. Similarly, inserting your own rules will be easy. Any comments you have on the content of the rules in general or specific points and queries can be sent to the e-mail address below or posted for general discussion on the website. If you require a rule to be crafted to suit something we have not included then also feel free to contact us. Informed criticism and advice is equally welcome. We hope that you will find these rules to be at worst playable, and at best, thoroughly enjoyable, for we believe it is most important that the wargamer never forgets that it is, as the hobby is named, a game. Thanks to those family members who have suffered as we laboured!!!! !